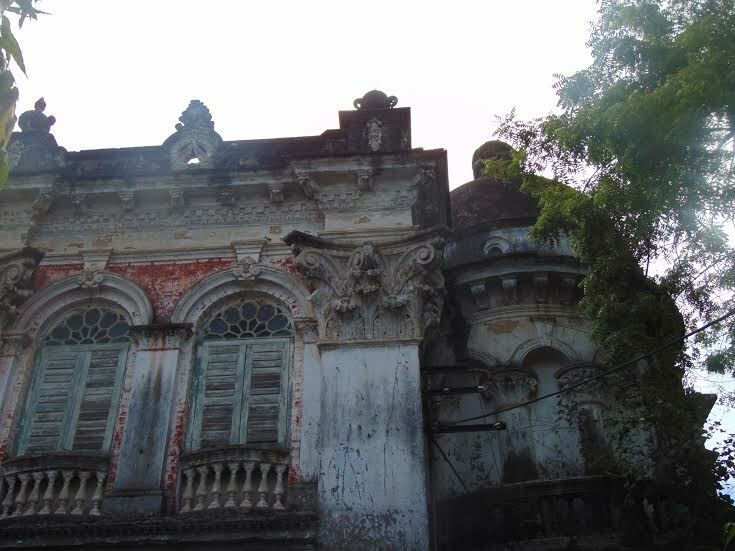 One June morning we decided to explore the town of Chandannagar, about 35 kms from Kolkata. Earlier referred to as Chandernagor, this town on the banks of the river Ganga traces its birth to the French. 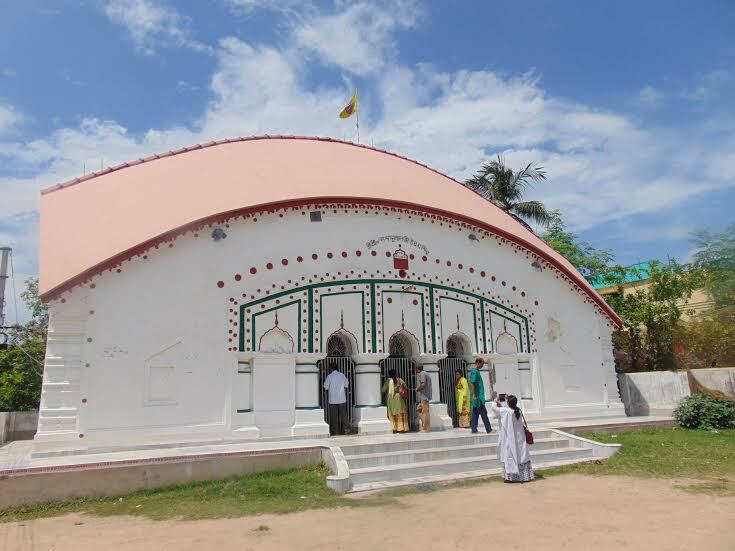 It is said that the town comprised of three villages – Borokishanpur, Khalisani and Goldalpara. Later on a few other villages were added, too. As to the etymology of the name, opinions vary. According to some, the name derives from sandal (chandan); according to others, the river’s course here is shaped like the moon (chand) and, hence, the name. One of the oldest temples in this area is the Borai Chandi temple and the temple could be another source of the town’s name. 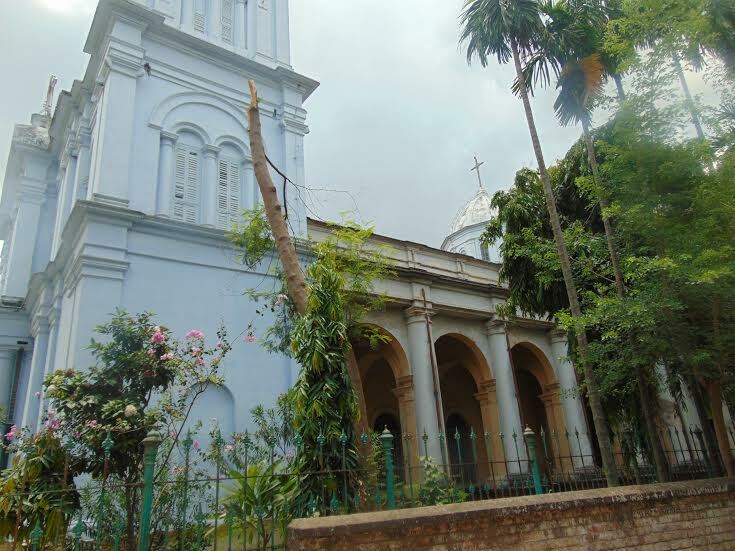 Chandannagar was also known as Farasdanga, Farasi (French) and danga (land), a name that recalls its long French connection. During the time of the Mughal rule in India, the French got permission from the Nawab of Bengal, Ibrahim Khan, in 1673, to establish a trading post on the banks of the river Ganga. By 1688, it became a French settlement. Many years later, Joseph Francois Dupleix became the governor of the city in 1730 and it is during this time that the city developed and became a major centre of trade and commerce. The erstwhile residence of Dupleix is now a museum, Institut de Chandernagar, and is located on the strand. Chandannagar was captured by the British in 1757, many of the town’s fortifications and houses were destroyed. The French regained control of the town in 1763 but lost it again in 1794 during the Napoleonic Wars. It is due to these wars and the rising power of the British East India Company that the town lost much of its importance as a trading post. The French got the town back in 1816 and it remained part of French India till 1952, when a referendum decided that Chandernagor would be part of the Republic of India. As we enter the town from the south, we pass the Liberty gate that was constructed in 1937 to commemorate the fall of Bastille. The gate bears the name Chandernagor; the slogan of the French Revolution, “Liberté, égalité, fraternité”, and FR are etched on it. It is said that one such gate existed on the northern entry to the town as well. 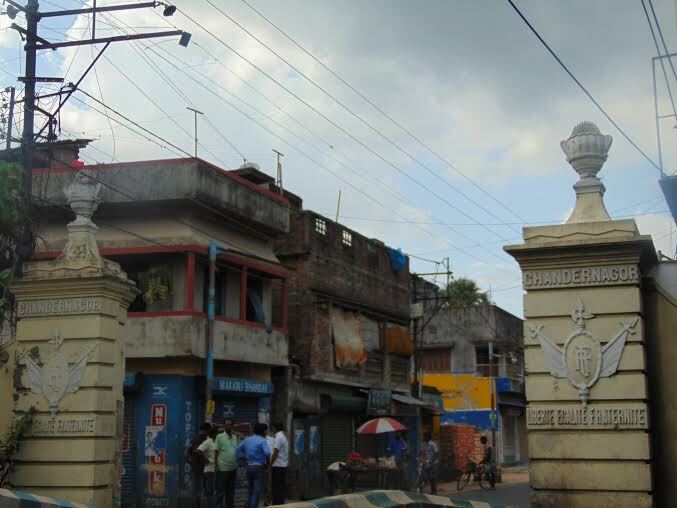 Chandannagar looks like any small town, with the Grand Trunk Road passing through it. There are shops and houses on both sides and many lanes and by-lanes stretch out from it. 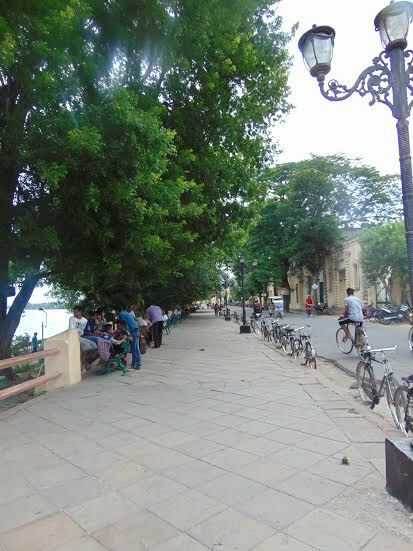 It is one such street that takes us to the Strand, which is one of the landmarks of Chandannagar. As we move towards the Strand, I am struck by a building that has huge pillars and a dome. As we move towards the front of this structure, we are surprised to see the front façade of the structure brightly painted, a stark contrast to the rest. This is the Sacred Heart Church, a Roman Catholic Church that stands very close to the Strand. The Sunday morning mass over, the Church was empty but for a lone cleaner at work. 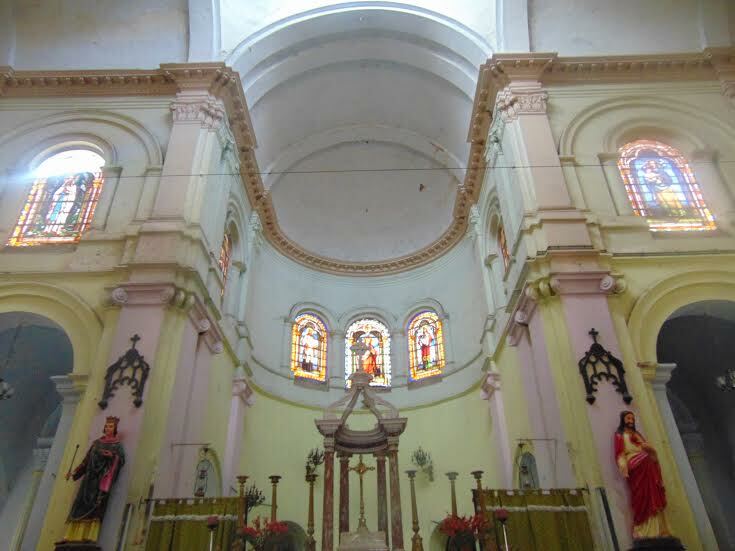 The stained glass windows high up, the huge circular dome above the altar, an old organ in the corner, a confession box, a beautiful carved pulpit with wooden stairs leading up, a vaulted roof – the interiors had a wonderful old-world charm to it. It is a pity the church lacks maintenance. As we leave the Church and move towards the Strand, we notice a ghat that stands out in magnificence. This is the Durgacharan Rakshit Ghat, an elegant structure that stands on columns embellished with stucco work. 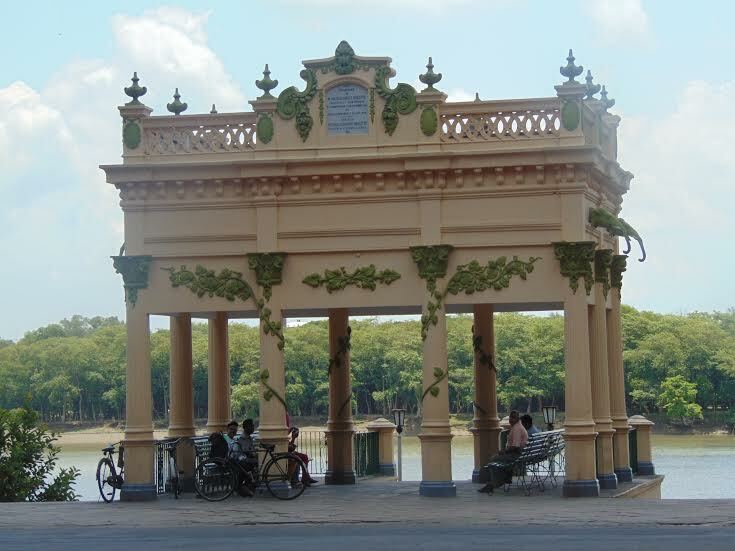 One of the major attractions of Chandannagar is this Strand and it is very popular with locals and tourists as well. 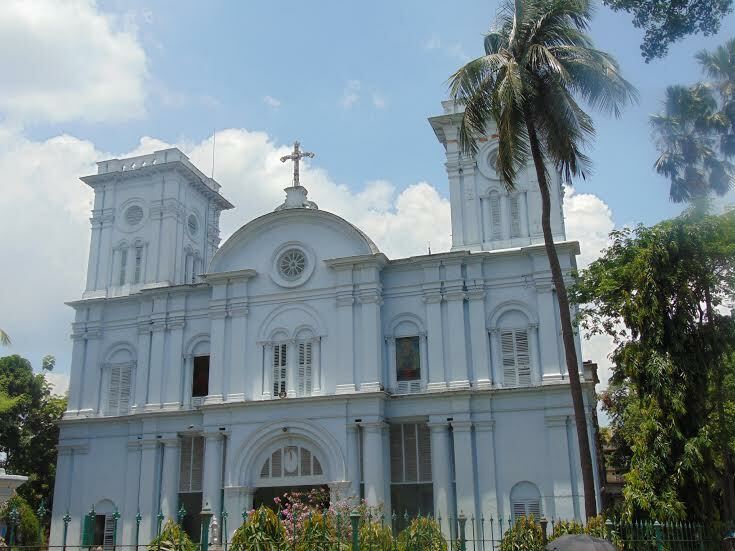 A number of important buildings are located here: the Chandannagar College, St. Joseph’s School, and the Museum, to name a few. As we walk across the Stand, we notice locals sitting on the steps of the many ghats, lazing on the benches laid out, the trees all along provide ample shade even on a blazing June day, the chaiwala selling his ware, a few monkeys loitering, young men chatting, the river meandering away, the clouds wafting, a few small boats on the river, the trees on the opposite bank, a barge carrying coal, a few men sitting on another ghat with fishing rods. There was a langour to the place that seems to be accentuated by the gentle breeze from the river. At the end of the Strand is the Patalbari, so called because its lowest floor is submerged under the river; ‘patal’, meaning underground and ‘bari’, house. Rabindranath Tagore visited the house many times, as did the social reformer, Iswar Chandra Vidyasagar. The palace of the governor, now a Museum, is another major attraction of the town. Its huge pillared façade is a wonderful sight. 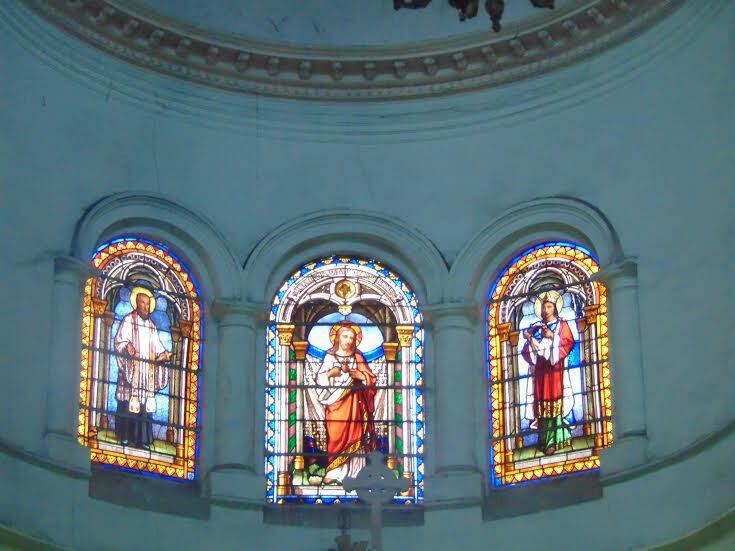 The Museum houses artefacts that date to the time of the French presence in Chandannagar. 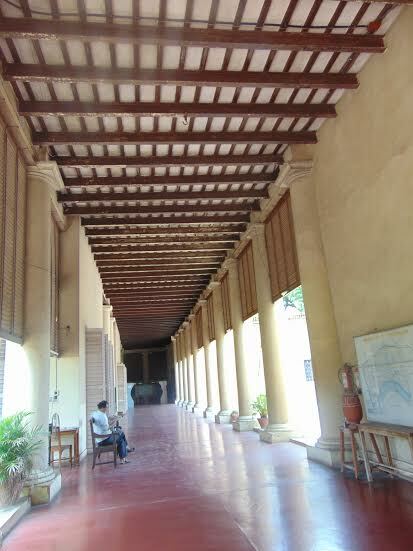 French is taught in the institute as part of a cultural exchange between the French and Indian governments. As we move along G.T. Road to see the Nandadulal temple, we pass by the Sacred Heart Cemetry, which is located just opposite a huge pond, called the Lal Dighi. 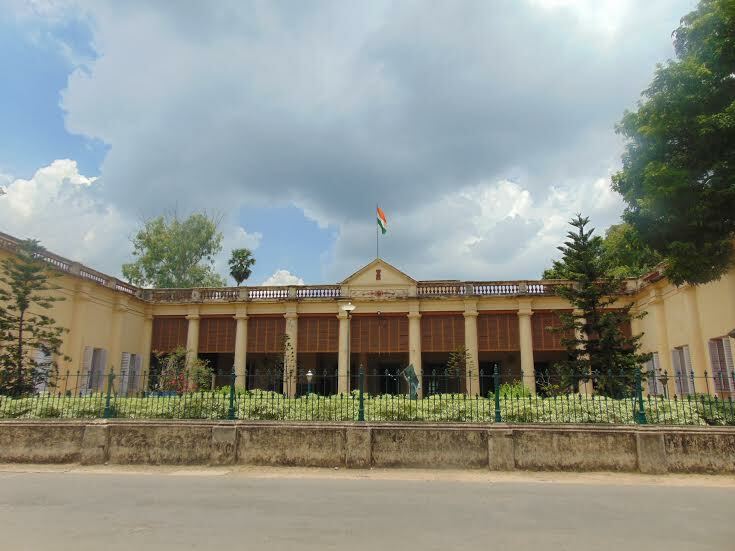 Another massive building catches our eye, the Nritya Gopal Smiriti Madir that houses the Chandannagar Library and hall. 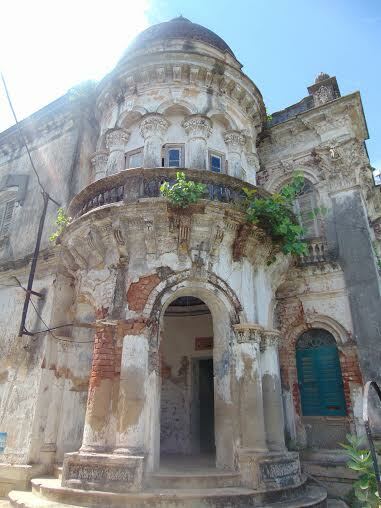 This building, with it huge windows, ornate columns and balconies, is a visual treat in spite of its dilapidated state. Standing tall on the G.T. Road effortlessly, it makes us stop for a while and admire its beautiful façade, which must have been wonderful during its heyday. During our trip through Chandernagar, we came across old buildings, some still standing tall, many abandoned, while for some others only the gate remained, a witness to bygone times with a story to tell. Near the Nandadulal Temple, I spy upon a huge house behind a wooden gate. On a plaque I find the name Sleepy Hollow, a quaint name for a house that was still inhabited. It looked homely with small flower creepers all over the gate and blooms within, and appeared to belong to a much older time. The Nandadulal Temple dates to 1740 and is said to have been built by Indra Narayan Chowdhury. It is believed that the cannon balls fired by Robert Clive’s army created holes on the temple wall. Bereft of any embellishments and with a simple whitewash, the temple has lost its aesthetic appeal. Chandannagar has a charm of its own, a charm that persists long after one has left the place far behind. As I stand on a platform that juts out from the Strand into the river, I lose sense of time, as the gentle breeze wipes out the heat and humidity of the scorching summer. As we walk along the Strand, I cannot but be filled with a sense of being captive in the past. And, yes, the taste of the ‘jalbhara’ sandesh, a sweet Chandernagar is famous for, lingers on. I have heard of the place before but this post brings it to life. Only if we as patriots had taken more pains in preserving our architectural splendor.